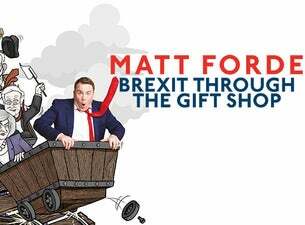 Matt Forde (as seen on Mock the Week, Have I Got News for You, The Royal Variety Performance and Question Time) brings his sell-out Political Party night to the Leicester Square Theatre for an EU Referendum special. As well as featuring up-to-the minute stand-up comedy about the referendum campaign, Matt will also be joined by two of the biggest names in the debate: Alan Johnson campaigning for Remain and Dr Liam Fox campaigning for Leave. Alan Johnson is the former Home Secretary leading the Labour In campaign. One of Labour's most popular politicians, he is regularly seen on This Week alongside Andrew Neil and Michael Portillo. Dr Liam Fox is the former Secretary of State for Defence and has been a leading Eurosceptic in the Conservative Party for many years. He stood against David Cameron for the leadership of the Conservative Party in 2005 and has recently been tipped for a return to the Cabinet. This is a unique event, not just showcasing the best arguments on both sides of the referendum divide, but having a laugh about it all too.